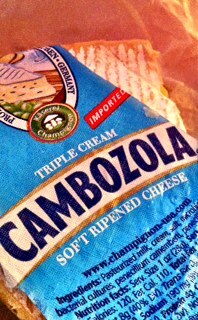 Cambozola is an amazing soft blue cheese – It sounds Italian, but it is from Germany and it is without a doubt my favorite blue. Red Cabbage and frozen peas are always in my pantry, and Cambozola, if I am thinking straight. I love this combination. The thinner the cabbage is shredded, the better this combination is. 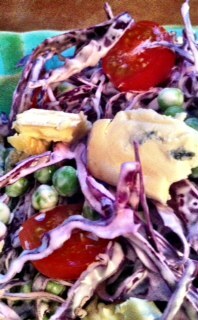 This entry was posted in Recipes and tagged Blue Cheese, Cambozola, Frozen Peas, mayonnaise, red cabbage, salad. Bookmark the permalink.